Special features: Sometimes called the 'hedge brown'. 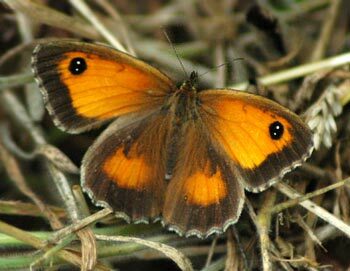 The gatekeeper has orange wings with a thick brown border. In the corner of the forewings is a black dot with two white dots inside it. 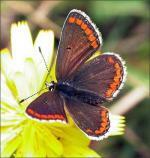 On the hindwings is a smaller black dot with one white dot inside it. The undersides of the wings look very similar to those of the Meadow Brown except the hindwings of the gatekeeper have a row of white dots. Distribution: Found throughout England and Wales. Gradually spreading into Scotland. Months seen: July to September. Habitat: Hedgerows, roadsides and bramble thickets. Food: Nectar. The caterpilars (grey/brown with white stripes) feed on meadow grasses.